One of my favorite times of year for reading is the fall because of the cooler, crisper temperatures. Accompanying the great conditions for reading is also the great opportunity for fun food and treats. Let's close up the month of August Link Love with a pairing of your favorite reads and foods OR share a favorite recipe OR talk about our favorite cookbooks. There are just so many possibilities! It's that time of year for kids to start heading back to school, which also means the end of the summer. This week, let's either look back or fast forward . . . talk about our favorite summer reads combined with our favorite summer moments or talk about the book you are most excited to read now that school is back in session. Where are some of your favorite places to get your books? Do you frequent a local library or bookstore? Or, would you rather focus on the word "haunts" and share the books that haunt you today? Get creative with this one! Here at Book Bloggers International, we have decided to try something a little different during the month. Typically, we have guests share their thoughts on a specific topic right here on the blog. However, during the month of August, we are wanting all of you readers to share your own links on a variety of topics. 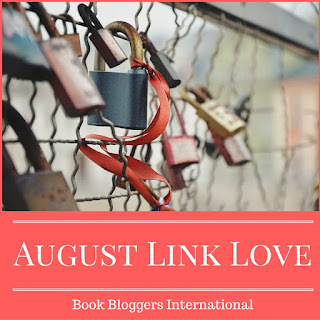 Every Wednesday, a link-up will be posted here, and throughout the week, we want you to share a link of your very own interpretation AND visit all those who share as well. Afterall, the purpose behind the blog is to encourage blogger chatter, and what better way than to visit and explore old and new blogs! Mark your calendars now with the schedule below, and be sure to stop by each week to participate in a little August Link Love! All book bloggers in all forms are encouraged, including book bloggers in the traditional sense, as well as booktubers and bookstagrammers. Are you excited? Which of the topics excites you the most?